Gordon Currie Art Vibrant and Elegant. Today I wanted to touch base and post some updates on current paintings and some misc comments on marketing. Hopefully there will be some interest stuff that will appeal to my clients, friends and others who follow my work. This past week or two, I purchased some 11 x 14 canvas boards to paint on. Over the past months I have created a number of paintings on larger canvases. This was based on some feedback from followers who indicated they wanted larger canvases for their new homes. So of course, I created the larger pieces and then some feedback came in that I should paint smaller! LOL! So I am going to paint a few at the 11 x 14 size. The current painting I am working on is an acrylic of a fence garden scene with two rows of birdhouses. Some are traditional (birdhouses) while others are more whimsical. The idea is based on the concept of lots of birds living in a neighbourhood. Its going to half a nice weathered fence with lots of colourful houses. I am excited as I have painted bird houses before and always had no trouble selling them. I will post some pictures very soon. 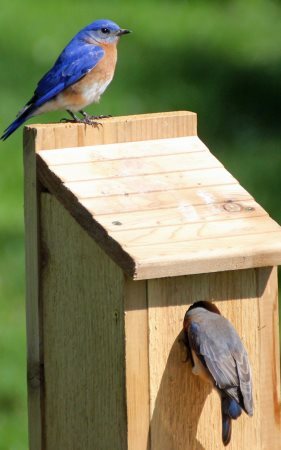 The birdhouse image here is just a picture from Google. My paintings are different. I wanted to mention that I recently joined INSTRAGRAM. Its been amazing so far and I have garnered alot of interest and followers in a short timeframe. If you are on Instagram, please make contact with me. I currently have 2 paintings on display at Hug A Mug on 102 ave in Dawson Creek. They include my old growth forrest painting (Cedar Giants) as well as one of my paintings of Birch Trees. At Baked Cafe I have 3 paintings including a FireFighter painting and an old growth forest painting of a fallen tree. These two facilities ( coffee shops ) are on the art walk going on in Dawson Creek. Its worth checking out. All of the paintings I have on display are for sale, contact me if interested. Since launching my website at GordonCurrieArt.com, I have tried hard to promote myself and my paintings. To be honest, I have no problem successfully promoting other artists, I have done this for years. But its been…challenging to market my own work. The cobbler fixing his own shoes..!I have the techniques and skills and certainly the software experience. The challenege lies in identifying the market. Let me explain. In the past years, I sold many watercolours and acrylics. My half sheets (15″ x 22″) originals sold for about $400 to $600. Prints of these watercolours ran $115 to $150 (sized at 13″ x 19″). My acrylic paintings in the past 2 years ran from $300 to $600. I will be selling prints of many of these acrylics this month of many of my original works. Now what has been interesting is that the primary demographic of buyers (and I really don’t mind sharing) have been women (87% of buyers) that are typically 50+ yrs old. Much of my recent works that have sold have been women aged 20-30. One more stat that is worth considering and this is a biggie in my mind. About 90% of my sales of originals go to the United States. Yes, the USA! To be more specific, about 75% in the eastern US and 25% in the midwest. Amazing eh? So why so many USA sales? Firstly, the population is about 10 – 11 times that of Canada. Americans tend to buy more art to a certain degree as they are not as conservative as we Canadians. Those that have bought my paintings in the USA tend to buy more than one or they will send me a referral of friends and family. If you hop on the Internet, of every 10 people you meet, only one will be a Canadian while 9 will be US based. I do get interest from many outside North America (primarily the UK, Australia and the Orient). Also found that Americans will tend to buy artwork for birthdays, anniversaries, Christmas and special occasions. Locally in North BC, I have promoted my work locally and had great feedback but I am reminded that I really have to look at the big world of potential collectors. So wrapping up, I plan to focus alot on more marketing and encouraging people to collect my work. I can produce 3-4 original works a month and thats 30-48 paintings a year (considering holidays). I create work that appreciates and brings joy to a home! Gordon Currie has been painting watercolours and acrylics for over 10 years. His work has been displayed all over Canada and the US in both private collections and displays. Send us a email to Subscribe to our newsletter and stay updated on the latest paintings and special offers!